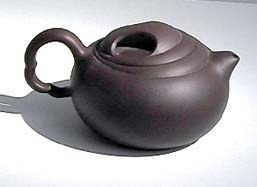 According to a legend, the very first teapot was created by the servant of a scholar, a Jinsha monk, some 500 years ago. 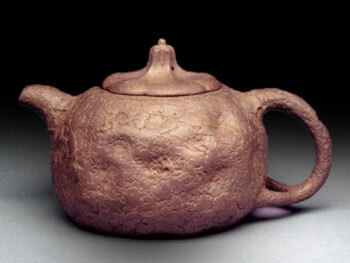 The servant, Gong Chun, made some teapots inspired by tea-treetrunks that were regarded as very valuable at the time. 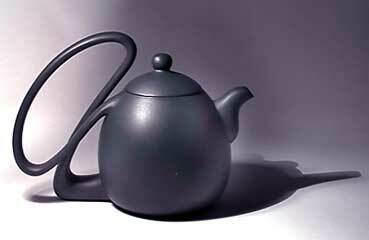 Quite clumsy and rough shaped, it had all the features of a modern teapot. Even to this day this 'original' is being copied over and over and a select group of (mainly Oriental) collectors find pleasure in having it. In Chinese eyes, the Gong Chun teapot is the ideal size for a teapot: small enough to carry with you and large enough for the fragrance of the tea to flourish. Chong Chun established the appliqué design-style, imitating nature. 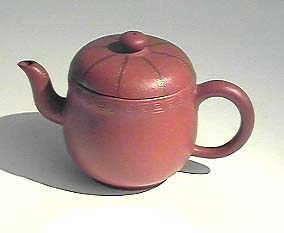 The pot is in the collection of the National Museum of History in Beijing. Nice details are that he carved his name inside the pot and a fingerprint is visible in the fired clay. 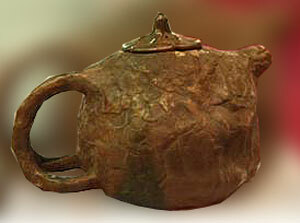 After extensive studies, the pot was authenticated and around 1950 donated to the government. 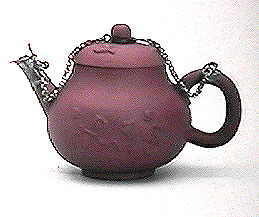 Before that time there were pots around that looked like teapots, but they were used to pour wine. In those days tea was cooked like soup. 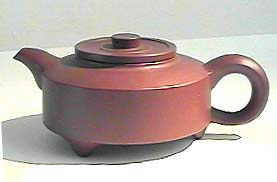 With the discovery of making tea, the way we do now, there was the need for teapots for the tea to simmer. Tea suddenly became a 'cult'. 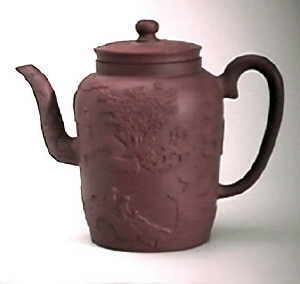 In our industrialized world, for potters the teapot became an archetype, an object in which individualism and history can fuse. 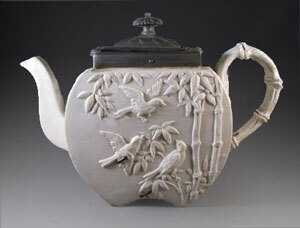 An object, known to all, now, in the hands of the modern potter-artist, past its utilitarian self. 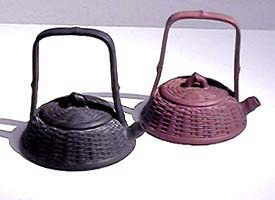 It was the Dutch traders who first brought tea, and these Yixing pots to Europe. From the beginning of the 17th century the Dutch East Indian Company shipped tea from Japan and China to the Netherlands. 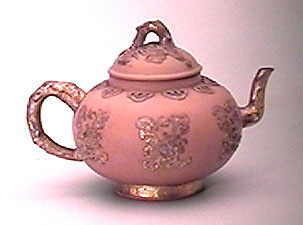 With the tea came the teapots, the first to be seen in Europe. 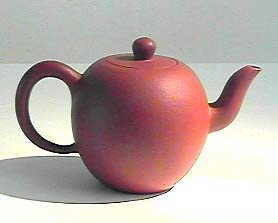 Amongst these were the red-stoneware tapots, made in Yixing, west of Shanghai. 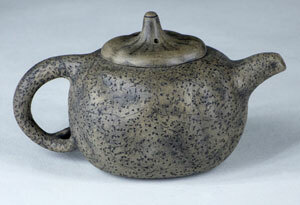 According to a legend, the first teapot was created by a monk in Yixing, some 500 years ago. 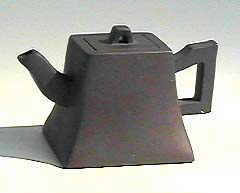 Clumsy and rough shaped, it had all the features of a modern teapot. 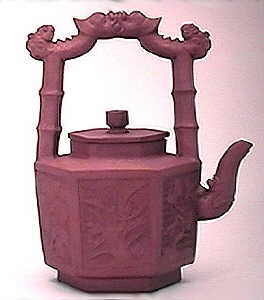 These magnificently balanced teapots were famous in China for keeping heat, arome and odor of the tea well preserved within the pot. In the 16th and 17th century, due to the splendid landscape around Yixing, artists, poets, scolars and caligraphers came to this area for pleasure and rest. 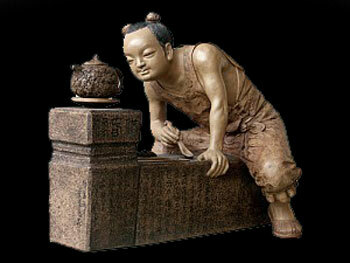 They cultivated tea-drinking and acted as art-protectors to the potters. The potters build the pots completely by hand and so created time after time, unique works. They were proud of their work and signed them with their own name. 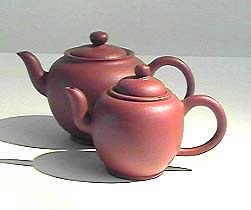 The red stoneware teapots became rare, precious oriental curiousities in collectors-cabinets. 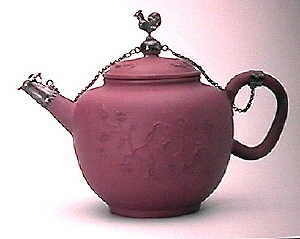 With the rising popularity of teadrinking (around 1670) demand for teapots rose, and red ceramic teapots appeared in the households. In the 17th Century the Dutch brought Yixing to Europe. Their influence spread fast over England, Germany and the Netherlands. Today you can see great imitations in European museums. 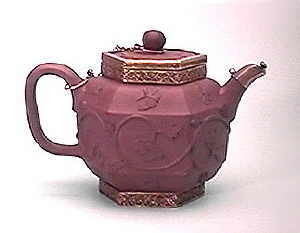 Wedgwood, Meissen, the manufacturers of the day made pots to equal the expensive items from the orient. The V.O.C. seldom shipped vast quantities of red stoneware. Most of it came to Holland as single pieces (or small amounts) with the luggage of sailors, crew or individual travellers. They were sold for considerable money on the markets. Delft potters soon saw a profitable business in copying these desirable products. Around 1680 the Delft potters were successfully imitating. Potters such as Ary de Milde and Jacobus de Caluwe sold rather large quantities. 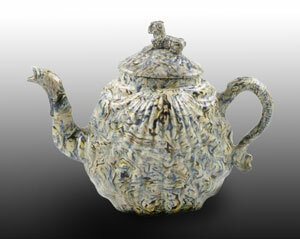 Not soon after also Staffordshire and little later, Meissen produced imitations. 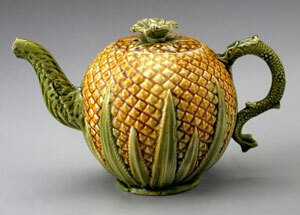 Only a few years after the Dutch got successful with their new-style teapots, the English adapted the new ideas rather quickly and even enhanced the nature-like designs of the Chinese. 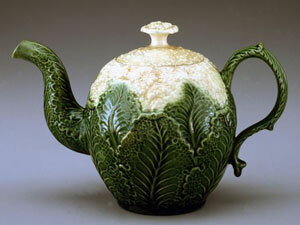 From colourful majolica glazes to the 'marbelling-effect', called Agateware, the English really took off, and introduced more exuberant teapots than anywhere else in the world. Parian ware - Copeland - 1874. 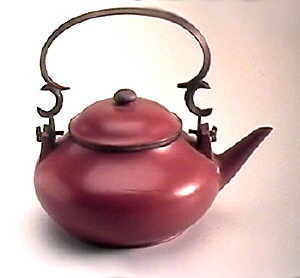 The production of Yixing teapots nearly comes to a standstill during the 2nd World War. There was no revival until 1954, after the People's Republic was established. 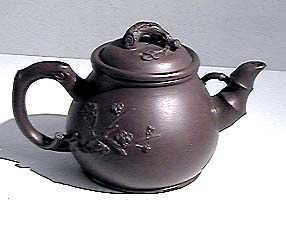 For some years people make teapots like in the old days, but during the Cultural Revolution it seems that the traditional, classical approach is discouraged. 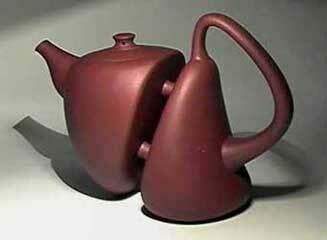 Teapots are utensils, nothing more. Individual signs such as signatures are out of the question, taboo. A Hong Kong businessman, K.S. Lo, started seriously collecting. He manages to obtain some beautiful antique pots. He then comes to Yixing to find out about the situation there. 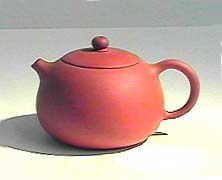 Thanks to his encouragement the master teapot-makers once again started making quality teapots. They were exported to Hong Kong, Singapore and Taiwan. 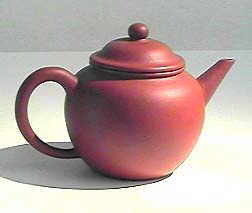 Taiwan is one of the most recent markets for Yixing ware. Gradually Western travelers started to get interested in these sensual pretenselesness goods. 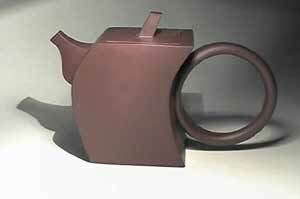 Jeroen Bechtold feels very proud to 'round up the circle' by going back to China and having spend some time there, making novel Yixing teapots.